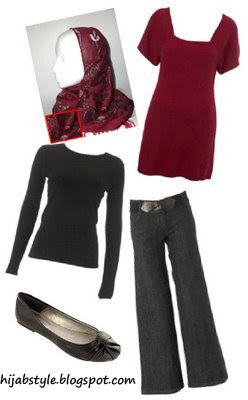 Scarf £7; Aziza Collections, scarlet knitted dress £35; Miss Selfridge, wide leg jeans £30; Dorothy Perkins, black long sleeve top £7; Dorothy Perkins, shoes £20; Barratts. i really love this "fashion-boxes" you make! no you don't have to do that ! I wouldn't mind doing it lol! Yeah I know what you mean.. you go through your warderobe and find things you haven't worn for years which still look great! Btw are you a UK sister?